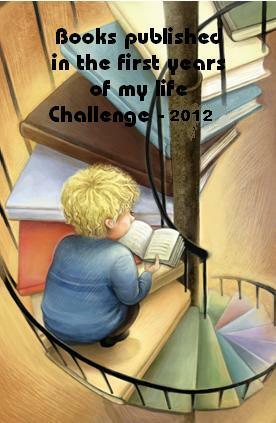 It has been a few weeks since I joined another reading challenge for 2012. Since most of my challenges will involve reading classics I decided to select some books that are a little more recent. Words and Peace has a challenge titled Books Published in the First Years of My Life. The challenge is to read at least one book from each year of your life, beginning with your birth year. There are four levels to this challenge and I am attempting the Toddler level, which means I’ll read three books. This challenge can be combined with other reading challenges and I plan on doing that. Dusklands and Interview with the Vampire are also on my 1001 book list which is a bonus for me. The Illuminatus! Trilogy is not on my list, but it has been on my shelves for over twenty years so I figured it was time to dust it off and to actually read it. Also it counts towards one of my other challenges, The Award Winning Books Challenge. I will probably read Anne Rice’s vampire novel in the fall during R.I.P. And Dusklands by J.M. Coetzee is one of ten that he has on my 1001 list, so it is probably time to get started on his works. I’m hoping that 2012 will be a great year for reading! This entry was posted in Books and tagged Anne Rice, Books, Dusklands, Interview with the Vampire, J.M. Coetzee, Novels, Reading Challenges, The Illuminatus! Triology. Bookmark the permalink. Thanks Nia…I wish you a happy weekend! I think so as well. It will be interesting to see if I notice a change in writing styles. You really love challanges. 🙂 No more challenges for me… apart from Carl’s (and not Carls). Not Carls…that’s funny. I like the bloggers I meet with these challenges. It is a fun way to interact and discuss books. And yes, I love challenges. Always have…at least these are less stressful than grad school or something. It is all good fun. I’m hoping it is and I like how the books are different genres. It provides a good mix. You are busy, busy, busy with the reading challenges! Good for you! I know. I may have bitten off more than I can chew, but I will do my best. And I made a promise to myself that I wouldn’t stress out too much if I don’t finish them all. This is only for fun and to read more books. I love Anne Rice. I recalled passing by her palatial home when I visited New Orleans November of last year – and I just couldn’t help but shudder and think that oh wow – this is where she wrote all her vampire novels. As I was walking through the streets of NO, trust me when I say I was constantly on the lookout for fangs, gaunt faces, and blood-red eyes. 🙂 But 1976? Really?? I also visited her home over a year ago and I tried picturing her in the house, hammering away on her novels. Especially at night, you can almost feel that the city has vampires and witches running about. It is an eerie, but fun feeling. I was shocked that the book was almost as old as me.